Now that she's won what her cabinet believes is enough support for a modified version of the deal, having finally corralled a majority for something resembling her current deal, the hard work truly begins: Convincing the EU to reopen negotiations on the withdrawal agreement, something officials have publicly insisted will not happen (though there have been whispers that they have been slowly coming around to the idea). 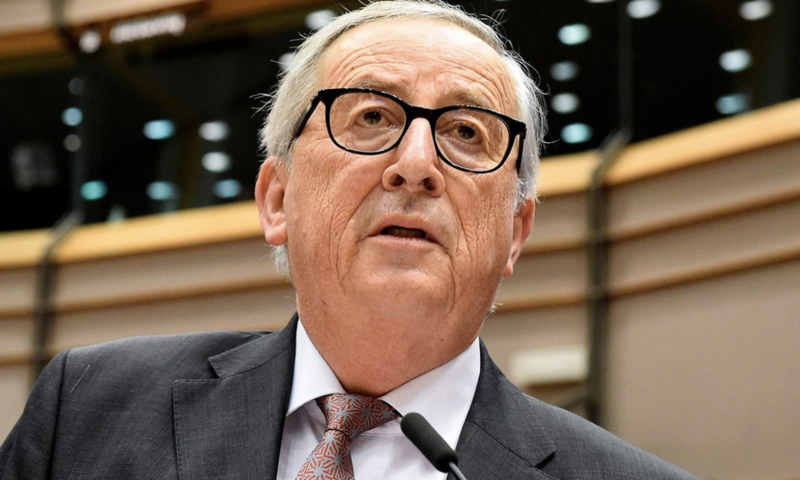 In a speech on Wednesday, European Commission President Jean Claude Juncker blasted the vote as irresponsible and once again insisted that removing the backstop from the agreement is out of the question. "This is not a game," he said, according to Bloomberg. If there's anything new to take away from the developments of the past two days, it can be found in a Bloomberg report published Wednesday afternoon that effectively confirmed what many have long suspected: That there won't be any movement on the deal - either from the EU or, likely, the UK, until the last possible minute. According to BBG, EU diplomats have pointed to a last-minute summit set for March 21 and March 22 - just a week before Brexit Day - as the likely time when a deal may finally be struck. Although May is getting ready to head back to Brussels to reopen the Brexit deal that she negotiated over the past 18 months, the EU isn’t planning to give her any concessions before she returns for a vote in the British Parliament on Feb. 14, according to the diplomats. Behind closed doors, European officials are sticking to their well-coordinated public line that they won’t rework the deal. The EU is in no rush to convene an emergency meeting of EU leaders, which would be necessary for any changes to the deal or for a Brexit-day delay. Diplomats point to a scheduled summit on March 21-22 -- just seven days before the U.K. is due to leave the bloc -- as the moment when the two sides could be forced to act. Some senior figures in the EU believe the U.K. needs to be all but out of options before accepting the deal, diplomats said. May met with Labour Leader Jeremy Corbyn on Wednesday and the two reportedly sparred over Labour's demands that the UK commit to permanently remain a part of the EU customs union - an idea that's anathema to Tory Brexiteers. She's also due for a phone call with Donald Tusk Wednesday night (he has already publicly reiterated that he won't budge on the backstop). Ireland's prime minister and his cabinet remain committed to the idea that Parliament must cave and accept May's deal as-is, having warned that a return to a hard border in Ireland will not happen (a 'no-deal' Brexit would likely lead to a hard border returning), while simultaneously insisting that the backstop is an integral part of May's deal. In an interview with RTE Wednesday morning, Irish Foreign Minister Simon Coveney said the notion the UK could leave the bloc without a deal amounts to a threat to "jump out the window", adding that Ireland wouldn't cave to threats. He also offered a few unkind words for the Brady amendment, saying it was "wishful thinking:" to replace the backstop with a vague call for something better. "We are being asked to replace the backstop with wishful thinking,” he said, adding there are no obvious ‘magic’ solutions out there to reopen the withdrawal agreement. Instead, he said that the focus might be on the non-binding political declaration, which would be tweaked in an effort to calm U.K. concerns. Irish Prime Minister Leo Varadkar released a statement after speaking with May via phone on Wednesday where he "set out once again the unchanged Irish and EU position on the withdrawal agreement and the backstop." It added that the latest developments "reinforced the need for a backstop which is legally robust and workable in practice" and said the two leaders "agreed to stay in touch over the coming period," per the BBC. If there's any clarity to be found in the Brexit process, it's in the markets: The pound has sunk since the Brady amendment was adopted on Tuesday (and two amendments calling for a delay of Brexit Day were rejected) based on the idea that the UK is inching closer to a 'no deal' Brexit scenario. Because of this, Goldman Sachs has upped its "no-deal" Brexit probability to 15% from 10%, and cut the chance of Brexit not happening at all to 35% from 40%. But has anything really changed? A look past the headlines reveals that the basic facts on the ground haven't. UBS perhaps put it best in a laconic recap of Tuesday's vote, that still applies after Wednesday's outraged squawking from EU officials in Brussels. The interminably tedious EU-UK divorce continues. The UK government must renegotiate with the EU. The EU says it will not renegotiate. The UK parliament does not want a no-deal exit. There is no automatic delay mechanism, but there are votes in two weeks which might impose an automatic delay mechanism. And it looks like that's how things are going to stay for another month or so. But even as the reality that nothing will happen until the last possible minute dawns on markets, we doubt that will put a stop to the endless firehouse of Brexit-related headlines.